I was thinking the other morning about all the people that I truly love and care for, and how often I them them that. Some people I tell all the time, like my amazing wife. For others, it’s been a really long time. So I went through my phone contacts and sent a text to everybody I loved in it. You can’t tell anyone you love them often enough. There are a lot of people that I don’t see often enough to tell them that I love them. One or the other of us has moved or something. There are a lot of people that I moved away from in this last year that I love a whole lot and don’t get a chance to tell them. I also moved closer to others. Anyway, don’t be afraid to tell people you love them. They like to hear it, probably. It’s also nice to be told that you are loved back. So if you get a random call or message from me telling you that I love you, don’t be surprised. So as you may know, we’ve been living in Mountain Grove, MO for the last few months. Jacob found a job working for Ready Transport, I haven’t had any luck. As excited as we are that he has a job, we really miss spending all of our time together. So…we started brainstorming possible job opportunities in which we could work together. The other factor we were considering was finances. Jacob and I are trying to pay off all of our debt as soon as possible, which is made more difficult when only one of us is working. So, Jacob had an idea one day…what if we were truck drivers? They have team drivers, where two people drive so that the truck can go longer distances in a shorter amount of time (a truck driver is only allowed to drive 11 hours in a 24 hour period), and very often married couples will drive as a team. Most of the negatives associated with trucking have to do with time spent away from home and family – but what about when your family is on the road with you? Well, then your family is just getting paid to travel. We liked the sound of that! So I started doing some research. Speaking of which – our school is located in Phoenix, AZ. We’re excited! We’ll be doing training in Phoenix and then that will become our home base. Our current plan is to buy a camper and live in it the 3 days a month we’ll be home. 🙂 We’re equally excited about this fact. In regards to debt pay off, we’ll have ALL of our debt paid off in less than a year! So far it’s been impossible for me to say that without smiling. So if anyone has any trucking advice for us, please feel free to give it! I’ve come to find that there’s something intensely gratifying about accomplishing yard work. This may be, in large part, due to the fact that I’ve never really done much yard work in my life. Now wait a minute – before you start thinking that I’m a spoiled little princess – I grew up in the desert so there was never really much yard work to do. Most yards were decorated in “rockscaping” (it’s a real thing, Google it). So, to get back on track, Jacob taught me how to operate the riding mower today. At first I was a little scared (it’s loud and equipped with sharp blades), but once I got the hang of it I found it a kind of fun. As it was my first time out, my poor husband had to come behind me with the weed eater and get all the spots I missed around trees, rocks, stumps, and anywhere else I just didn’t get. (Marry well girls, marry well). While mowing was exciting, the best part of the yard work so far has been the planting and growing. 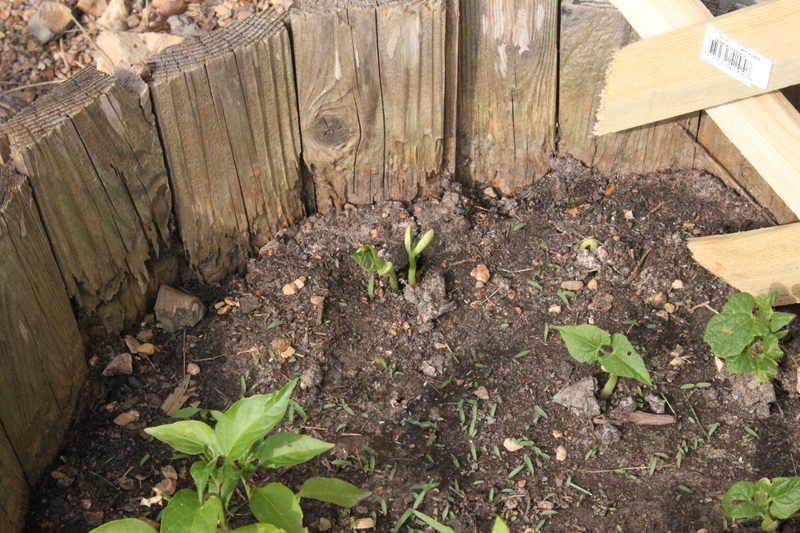 As I mentioned before, we planted a few things, most of which were starters so there was already a bit of plant there to look at. 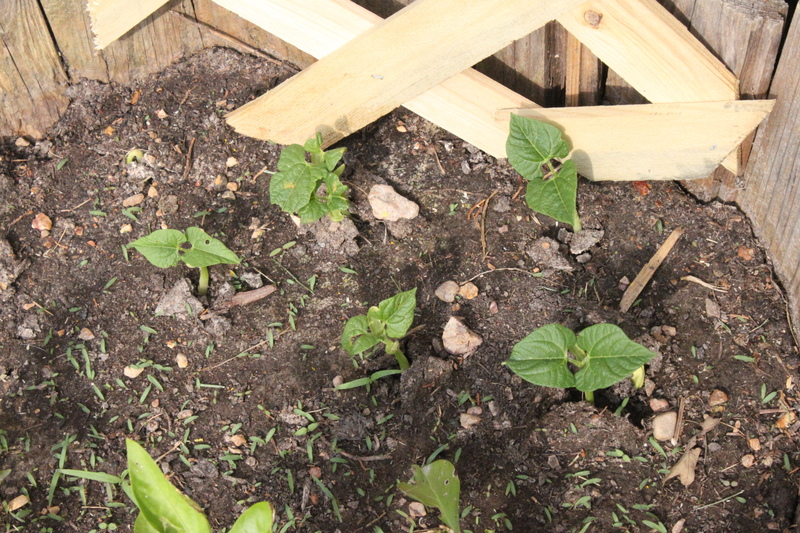 However, the green beans I started (all by myself!!!) were just seeds and over the last few days I’ve been amazed to watch them sprout and push themselves up through the dirt. It’s a wonderful feeling to watch something you put in the ground, as a little ol’ seed, grow and flourish! look at it! So cute! When they get a bit taller we’ll help them attach to the trellis so they can grow up the whole thing…it’s gonna be awesome!!! 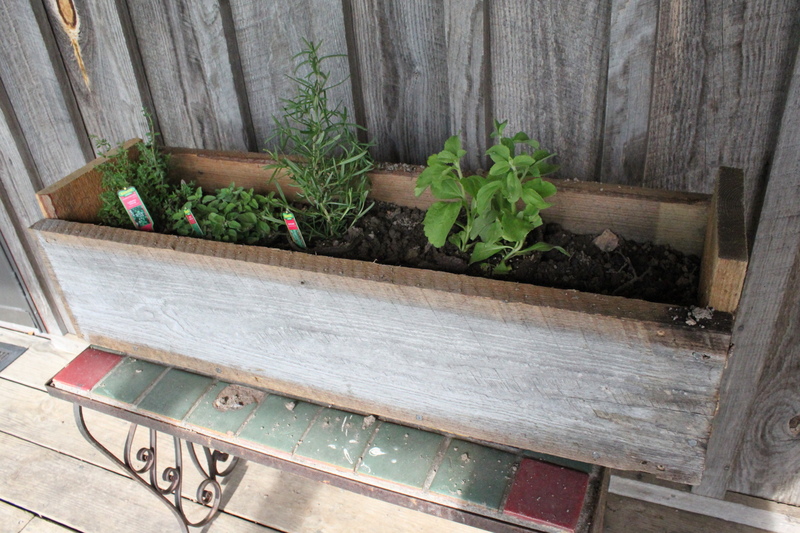 We also made an herb box and filled it with Thyme, Oregano, Rosemary, and Sweet Leaf (Stevia). Last night some animal, probably a hedge hog, tried to take out my Stevia plant. This morning Jacob found it completely pulled out and on it’s side. So we’re gonna have to find out how to prevent that from happening again. 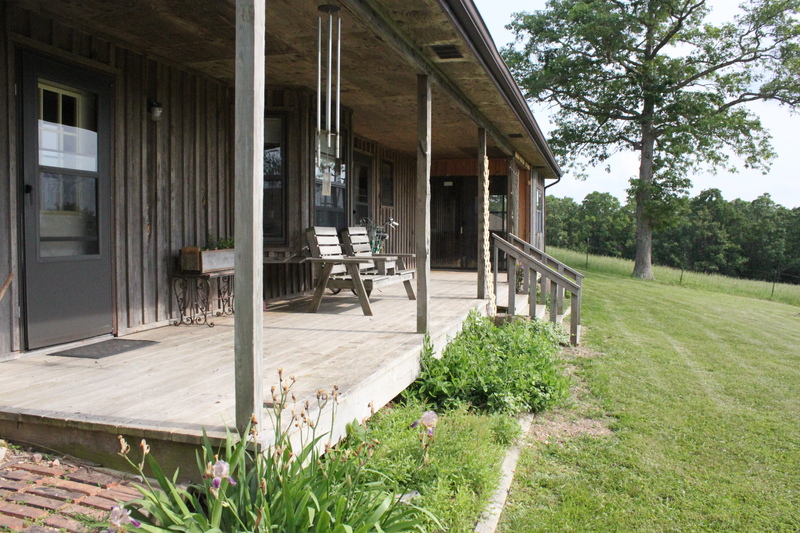 This is our lovely porch…I love it. So…speaking of things I love. Today is Jacob and I’s 6 month wedding anniversary. 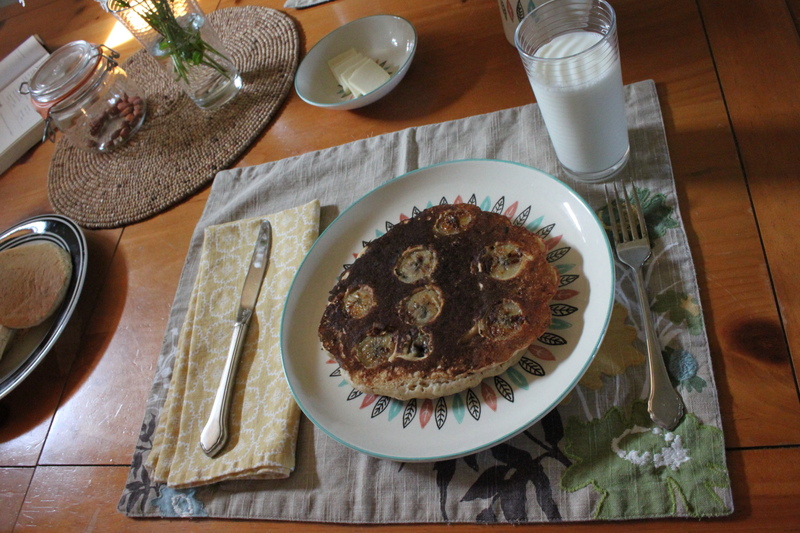 To celebrate Jacob made me banana pancakes for breakfast with a delicious homemade Rosemary syrup. I am not even exaggerating when I tell you that it was outstanding! 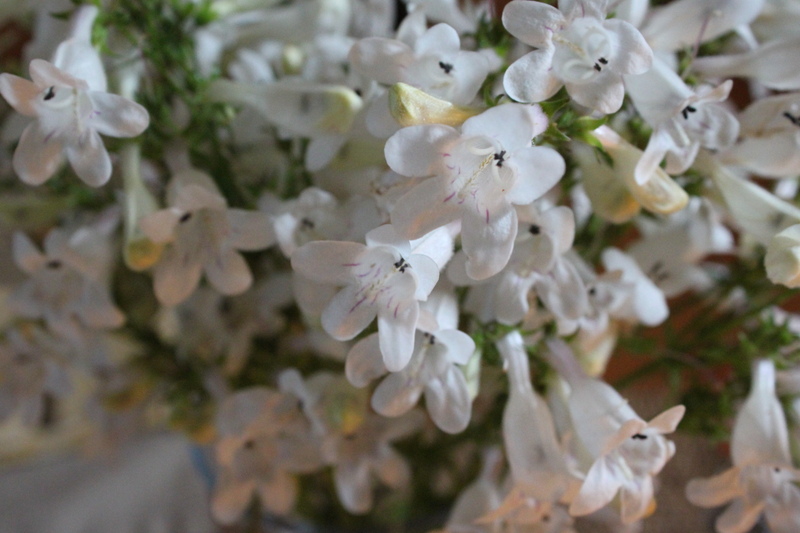 and to top it all off he picked some fresh flowers from the yard for the table. Like I said ladies, marry well!